Try substituting red pepper flakes or paste for the (some or all) black pepper or adding a little red wine for a spicier and tangier twist. Lay flat on a rack in a cold room (50-60°F) for 1-2 days. 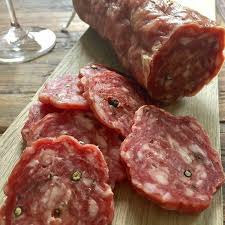 If sausage starts drying out to much or too quickly (white film starts forming) place in a plastic bag in the refrigerator overnight and return to the drying rack the next day. Flatten or weigh down sausage for 1-2 days. Remove weights and finish drying process checking regularly for 2-3 weeks. Sausage should be firm to the touch but not hard.